So far in Heroes for Hire we have seen Abnett and Lanning take us out on the street with a few different heroes…we have also seen that Misty Knight is behind the organization that essentially pays the heroes with secret in-tel that they needed and thus do the job for the information and sometimes money. Issue one was a fast fun filled ride with Abnett and Lanning writing and Brad Walker on pencils but does issue two make you want to look for not only another hero but another book? Read on to find out! The solid idea behind this book is that Misty Knight is basically this secret mission giver of good. Essentially if this was Charlie’s Angles she would be the unseen face (Charlie) giving the orders.The other great idea behind this is Misty is giving her Hires or rather her Heroes payment of information…which would lead me to guess that the people doing the job don’t always have to be Heroes per se.This is what sets up the next book. In Heroes for Hire #2 we are introduced to another mission this time with Silver Sable taking point. For me Sable was always an interesting character but very grey. I must say she hasn’t changed all that much. Misty is paying her in cash and has her go on a mission to track down an arms dealer who has been cause a lot of deaths. Then Sable gets in the middle of a fire fight and then finds out that everything is not as it seems. Apparently these guns have a magical aspect to them that the more they are used..the more the gun becomes fused to the holders hand and fires some type of soul demon bullets. Still with me? Ok good. So while all this is going on Paladin starts throwing around accusations at Misty for the types of people she has hired for the missions. 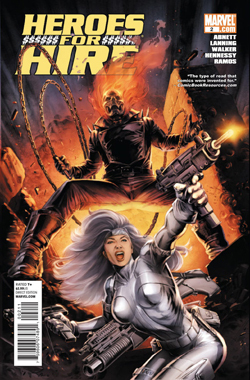 She goes back and forth with him while Paladin is doing some investigating of his own in the morgue.Paladin is then visited by Santana who explains the whole mystic side of the guns being traded and at that very moment Silver Sable is teleported out of one gun fight in New York and into a airplane hanger in Miami to be confronted by the arms dealer himself Baron Brimstone. Whew let’s take a breather a lot has happened in this book already as well as some little surprises that I did not mention for people who have not read the first issue. I love the pace of this book and it keeps you guessing on who could pop up next! We start getting a small idea in this book of a much bigger picture that Abnett and Lanning are painting and I gotta say it is interesting! We learn that supposedly Misty Knights baby with Danny Rand was a phantom pregnancy and that she is only doing these jobs until she is recovered and can go back out in the field herself. Crazy right?! Who has that much free time!Ok now back to the review! Well we have Silver Sable in Miami fighting of Baron Brimstone and Paladin snooping for leads back in New York. Misty finds out that Sable is in WAAAAAAY over her head and sends in a little help in the form of Ghost Rider who then helps take down Baron Brimstone with some great action panels! We also start to see Paladin looking more and more into what Misty Knight is up to only to find……………..ok look if you don’t want a big shock just stop there and trust me go pick up this book it is a lot of fun! Or hell just get issue one when Avengers #10 comes out for free!Ok so are you ready? Good here we go. Paladin finds out that Misty is not at her headquarters where she says she has been for more then three months.How does Paladin know this? Because he is standing in the room she has supposedly not left for three months straight!!! Bum Bum Bummmmmm. Now this was teased at the end of issue one and I am really sad that this wasn’t made more into a mystery. Or at least hold off on the reveal of the Puppet Master!Don’t get me wrong this is still a awesome story and there is plenty going on but I just feel it would have made a much more emotional impact if that was revealed much later on. Ok …now I have one other thing to address. The fact that they are putting issue 1 for free in the back of Avengers 10. I don’t feel like this means the book is bad or that it is even selling bad. I just think Marvel might feel it didn’t get the attention it deserved and I for one agree with them! So there! FINAL VERDICT: This book is a great example of how to use stand alone characters in a team. If the team is always static then we the reader always get something new and exciting out of the book! Heroes for Hire doesn’t need any gimmicks to make it work because it has great writers and great art…….this should be on anyones pull list!